IntelLiDrives released a new series of IP-rated direct drive (DDR) rotary servo tables. Direct drive rotary servo tables feature IP rated ingress protection. IP rating assures against ingress of water and external particles. IP65 rating assures against ingress of dust and small water jets. IP66 rating assures, in addition to IP65, against ingress of powerful water jets. IP67 rating assures, in addition to IP66, against water penetration under heavy water jets and when partially submerged. DIRECT DRIVE rotary tables provide superior angular positioning and are designed to eliminate backlash, friction and wear problems associated with worm, gear and belt drives. Low maintenance and high throughput characteristics of the DDR stages yields the lowest total cost of ownership. 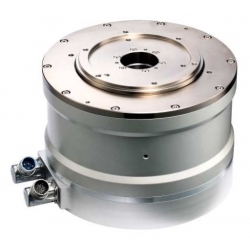 Accurate Positioning performance is assured with a precision ABSOLUTE encoder that provides arc-sec positioning resolution. The motor and rotary encoders are directly coupled to eliminate coupling backlash. Absolute encoder keeps track of its position at all time and provides it as soon as power is applied. This feature is particularly useful in applications where the equipment has power turned off between uses. No need to move to home sensor or index pulse to establish a reference position.